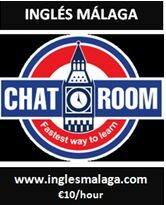 PLAN: THE INGLÉS MÁLAGA CHAT ROOM: LET’S TALK! Ok, no problem, Inglés Málaga, y The English Chat Room puede ayudarte. Regístrate y vamos a charlar–let’s talk!. What is The English Chat Room? The English Chat Room is a 1 hour group class (minimum of 3 students, no more than 6) where you will have the opportunity to talk about different topics in order to improve all aspects of your oral communication. The English Chat Room will help you improve your speaking skills by encouraging conversation through role-play, debates, mini- presentations and discussions. You will practise both formal and informal speaking. Your ability to speak more confidently and communicate more clearly. Your ability to express ideas and opinions. Your use of vocabulary, expressions and idioms. Your listening skills to help you better follow and participate in conversations. Your pronunciation and intonation in order to sound more natural and fluent. The English Chat Room is an ideal course if you you want to speak more confidently and communicate clearly. Please note: The English Chat Room is not designed to help prepare people for English exams, although, if you are preparing for an exam, this style of learning would definitely be useful. However, if your requirements are different, please take a look at other Inglés Málaga Cursos. What are the conditions and how much does it cost? The cost is €44 a month which you must pay for in advance. The price includes 4, 1 hour classes, once a week for 4 consecutive weeks. Inglés Málaga only closes for national holidays, so if your class is on a national holiday, you will be able to recover your class on a different day in the same week or the following week. The classes are private and take place in plaza de la merced, Málaga centro. If you are interested in participating or have some questions, then please complete the following Contact Form and we will email you as soon as possible.